Hobart’s thriving underground music scene has emerged amid the chaos of city life. While punk, art-punk and eclectic music styles have appeared and established themselves firmly in the local Hobart soundscape identity, underground electronic music has largely gone unnoticed as a unique facet of the music scene. 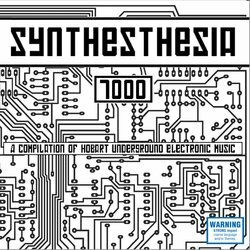 The compilation CD ‘Synthesthesia 7000’ is a collection of 29 songs by contemporary underground electronic artists based in Hobart. Raymond Scottwalker and Soil bring the Chill to the vibe. Renowned artists such as Filthy Little Star and Baltimore have taken an opportunity to develop music divergent of their usual sound for the CD. ‘Synthesthesia 7000’ will be released on CD and digital download on 12th January 2019. A launch show ceremony will be held at Studio 65 on Saturday, 12th of January at 2pm to launch the CD and activate the Bandcamp download.